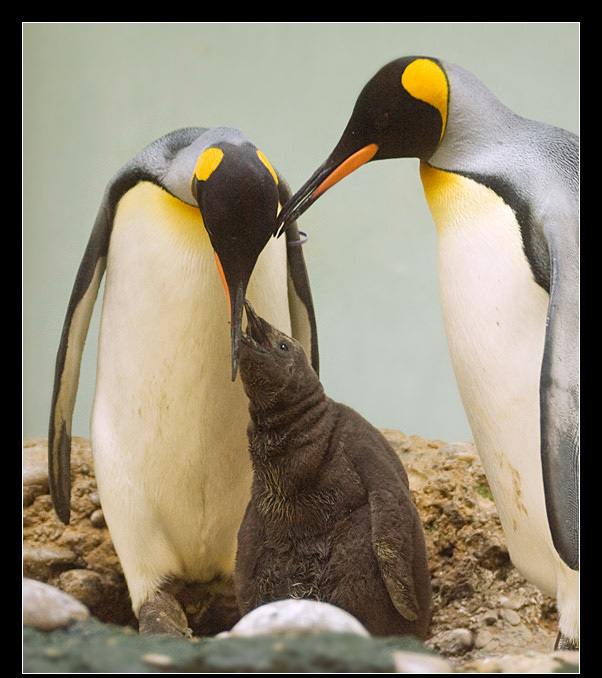 King penguins can take till 20 kg food in one meal. This means 1,5 times their own weight. This looks a lot, but you should not forget that they regularly have to stay on land for longer periods without food. Therefore they need large reserves, and moreover they need to feed their chicks too. Sometimes penguins also eat little stones to increase their digestion. When you counted in, you know that ¼ is not the same as 1,5 times their weight. Penguins have a very fast digestion and can transform the content of their entire stomach in energy(fat-reserves) in less than 6 hours. For the chicks this would be catastrophical and therefore penguins are also able to stop the digestion and even after three days (adelie penguins) they can bring back fresh food to feed the chicks. How they manage to process this food to porridge and, despite of a stomach temperature of 39°C, it does not taint, is still unknown.